How my dental visits fixed my teeth and my plot holes! I’m off to the dentist this week which as nice, patient and caring as he is, doesn’t exactly make me want to grab my maracas and samba down the high street (this being the fifth of six visits – broken tooth, root canal treatment and a crown refitted – Oh joy!). On the flip side, though, my weekly travels to and from the surgery have also helped solve a sub-plot issue in the next book I’m writing. One of my characters wasn’t fully conveying the depth of his shock enough to move the story forward. Something was missing. Well, bus journeys in my neck of the woods are rarely quiet affairs. Being a writer who is never without her trusty notebook and pen, my ears are treated to all manner of *ahem* lively conversations, one of which, last week, almost made me lean across the aisle and high five the poor woman in question. Her reaction both physically and verbally to her friend’s bombshell news was precisely the emotional ‘oomph’ I wanted from my fictional scenario. More body language. That’s what my main man needed! Yes, I felt nosey (although in my defence, this person on the bus was hardly whispering!) but my overriding feeling was gratitude and the realisation that no matter where you are or what you’re doing, where storytelling is concerned, observation is key. My smile was as wide as this when I reached the dentist! I’m guessing some of you must have had similar experiences? Last year we started the Life Cycle of A Writer feature where we take it in turns to blog about our writing journey and share the highs and lows, give and receive encouragement and generally chat about how things are going. This has proved a very popular feature and we are delighted to announce that we now have our first live gig! 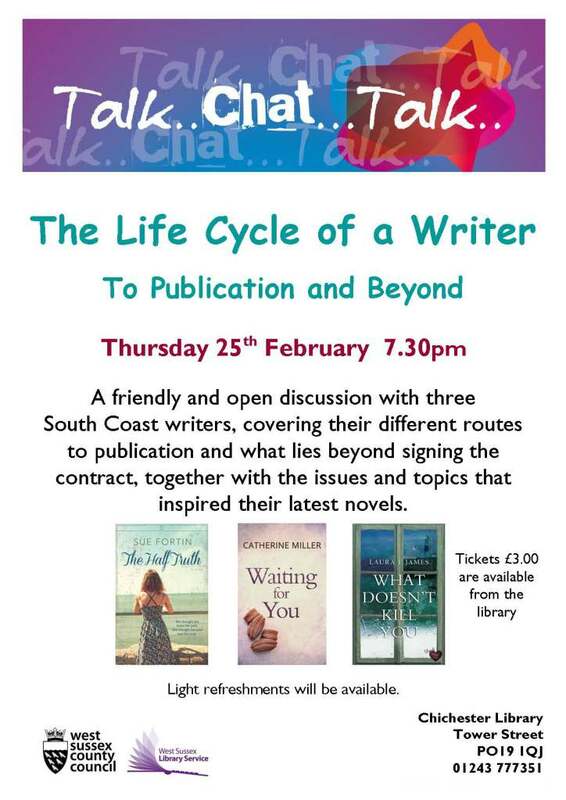 Laura, Catherine and Sue are taking The Life Cycle of a Writer to Chichester Library next month where they will talk about their paths to publication, what has happened since signing their contracts and also what inspires their novels. If anyone is in the Chichester area and fancies coming along for a chat, Laura, Catherine and Sue would love to see you.